One morning in late November 2017, observers passing a known porcupine (Hystrix africaeaustralis) den witnessed an adult porcupine entering followed by a juvenile (‘porcupette’). We set a camera trap (Bushnell Trophy Cam Essential 119636) to observe the entrance of the den, and from this we learned there were in fact two resident porcupettes (Figure 1). Figure 1. Two young porcupines outside of the den. The camera trap recorded the coming and going of two adults several times over the following days. Then on the night of 6 December 2017 a male honey badger (Mellivora capensis) was seen visiting the den several times. It first entered the den at 23:20 and left again 18 minutes later. At 23:49 it returned and entered a second time, emerging again after only 1 minute. It re-entered the den a third time at 00:02, staying inside until 00:18, at which time it emerged and apparently left the area. At 02:35 an adult porcupine approached the den and stood outside the entrance for 1 minute, appearing to sniff the ground and edges of the entrance hole. 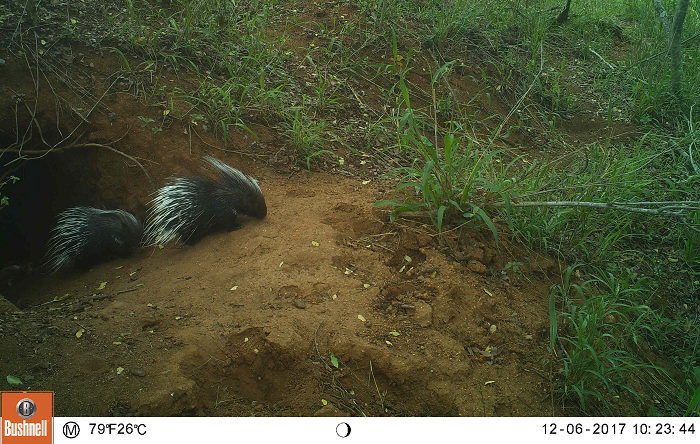 It is not clear whether the porcupine then entered the den or if it left the area as its movement was not captured by the camera trap, which was set to trigger every 60 seconds. 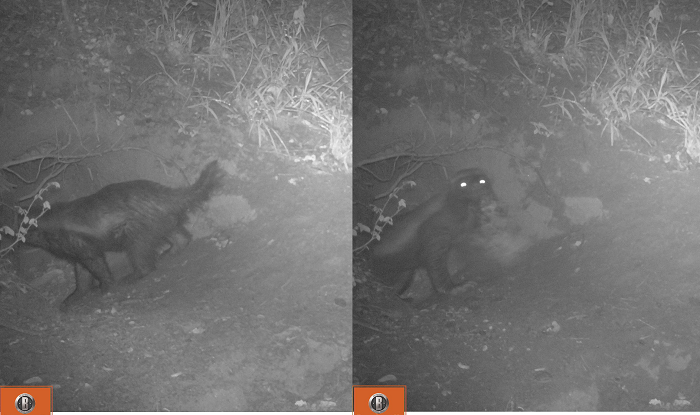 At 03:20 a male honey badger, presumably the same individual, returned to the den a fourth time, and at 03:34 was photographed leaving the den with a porcupette in its jaws (Figure 2). Figure 2. Composite image showing the honey badger entering the den (left), and leaving the den carrying a young porcupine in its jaws (right). The honey badger did not return to the den after this, and the second porcupette was never seen again. Begg et al. (2003) observed honey badgers often consuming large prey items (mammals >100 g) inside burrows, so it is possible this individual may have eaten one porcupette inside the den in any of the three extended periods it spent underground, before taking the second away with it. The two adult porcupines continued to utilise the den despite the loss of definitely one, presumably both, of their young, for another ten days. The den received three more visitors of interest – an African civet (Civetticus civetta) on 7 December 2017; a lioness (Panthera leo) on 8 December 2017; and a female leopard (Panthera pardus) on 14 December 2017. All three were recorded briefly sniffing at the den entrance but none made any attempt to investigate further and no interaction with a porcupine was seen. The camera trap was removed on 24 December 2017, the last photograph of a porcupine adult having been recorded on 17 December 2017. In May 2018 an adult porcupine was again seen by a passing observer at the den, with two new young. Begg C, Begg K, Du Toit J, Mills M 2003. Sexual and seasonal variation in the diet and foraging behaviour of a sexually dimorphic carnivore, the honey badger (Mellivora capensis). Journal of Zoology, 260(3):301-316. Thank you for publishing this important record. Thanks, John. We are slowly getting back on track with Biodiversity Observations after a year of difficulties. Hopefully we will get more records out like this on a regular basis henceforth.